In 1963, we began as a small shop known as Bob’s Glass, founded by long time Atascadero resident Bob Maxwell. The business was small then and required Bob to work a second job by day at the Atascadero State Hospital. His evenings and mornings were spent cutting glass and getting product ready for his customers the next day while his wife managed the store taking orders and ordering material. At this time the business consisted mostly of cutting glass for windows, table tops and other small items, periodically Bob would order windows and other custom items for customers. Bob’s Glass had a very good reputation for customer service because he was a likeable and honest person. Being the only glass company in town helped, as customers were thrilled not to have to go “over the Grade” to purchase or repair glass items. In 1964, Bob Maxwell sold Bobs Glass to Frank and Millie Hain who soon changed the name to Atascadero House of Glass. The business continued to grow and was soon relocated to the small mower shop building near where the company currently operates today. Dan Phillips ran a small barbershop down the street from the glass company in those days. He recalls often going down to help Frank Hain cut and move large sheets of glass to unload a delivery truck. they raised a young family. The Dejong’s worked hard developing a good reputation believing that the “customer was right” and their needs came first. Nick was involved in the Chamber of Commerce and JCs along with other clubs and activities. He had good values and treated his customers like they were part of his family. In 1977, Nick and John decided to move the business to its present location of 8730 El Camino Real to better accommodate their growing customer base. Two years later, in 1979, they sold the business, now know as Atascadero Glass, to my father, Roger Grant Sr. Prior to buying the business, Roger Sr. was engaged in the construction of the Diablo Canyon Nuclear Power Plant as a Project Manager for the Howard P. Foley Company. Roger Grant Sr. would subsequently operate Atascadero Glass for the next 25 years. During that time the business went through several economic ups and downs and saw many changes to the industry in both sophistication and technology. Roger Grant Sr. was instrumental in bringing in the latest technologies as they came available and positioned the company to become the largest of its kind on the Central Coast. As a 12 year old boy, I (Roger Grant Jr.), learned the glass trade from the bottom up; sweeping floors, making screens, cutting glass and repairing windows. Part of this apprenticeship time was at the side of Master Glazier Nick Dejong who had remained with the business for a time. When I finished college, I left the company to work in San Jose for National Glass as a journeyman glazier, and then later for a company called H & W Aluminum in Rancho Cordova. Eventually, I would leave the glass industry completely to work the next 13 years as a Police Officer for the City of Sacramento. In 2004, I left public service and bought the business from my father. 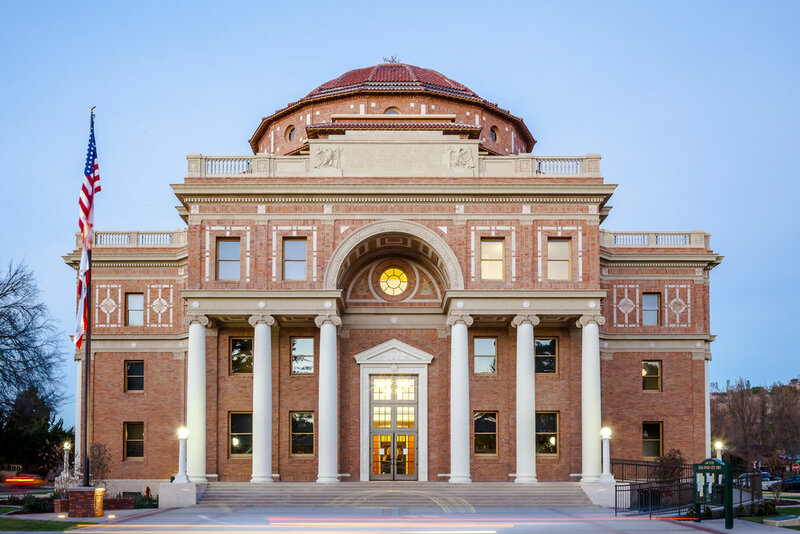 Our service area extends from Palm Springs to San Jose and our portfolio showcases a vast array of successful projects including hospitals, colleges, institutions, retail and industrial buildings, churches, wineries, and upscale residences. A variety of these structures are “green” buildings with LEED certifications. I am proud of our recognition by CAL OSHA as a Golden Gate Contractor for our continuous improvement in workplace safety and health management. Safety is one area we will not compromise on. My desire for us as a company is to deliver the highest value to our customers by adhering to the principles of our heritage; Integrity, Quality and Service. Replacing your old windows with new high efficiency windows can save you hundreds of dollars every year.